Come along to our first ever workshop! Have you got writing you’d like feedback on? Do you want to join the critique group, but aren’t sure if you know what to do? Sign up for our first ever Critiquing Workshop (2 – 3pm Sunday 14th Oct) and find out what critiquing is all about in a safe, friendly environment. We’ll be working together to critique one short story from lots of different angles and learning about how to give feedback that is both helpful and encouraging. It’s only $5 (on the day) to attend (we are fundraising so all the money goes back into the Guild). Hurry and sign up here – there are only twenty places available for this first workshop and they’re already filling up fast. 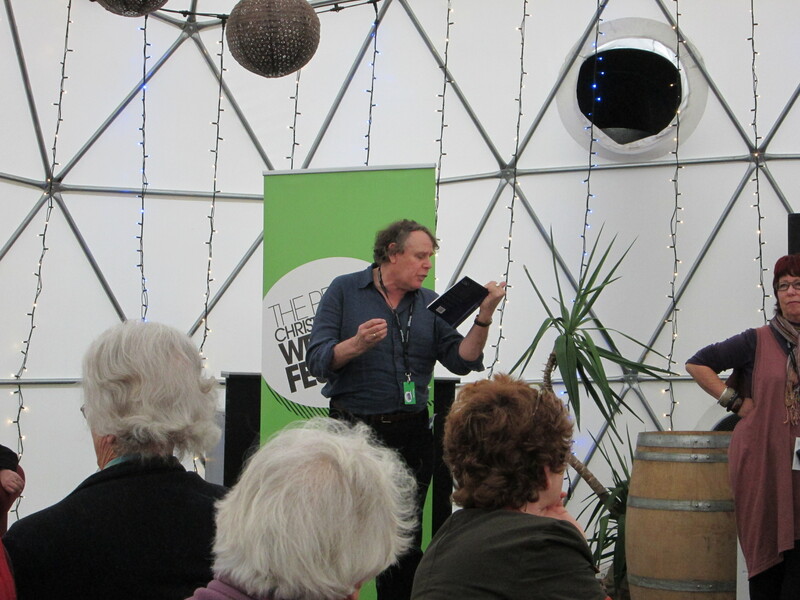 Beginning on the 30th of August and finishing on Sunday the 2nd of September, the Press Christchurch Writers’ Festival has seen authors from as far away as the UK and Europe travel to share the stage with our brilliant Christchurch authors. Many members of the Guild made it along, including the whole administrative team who were sitting in a row for the Why YA? panel on Sunday morning! That panel was all about the concept of YA and whether it was useful to the readers, or if it was just a marketing ploy. 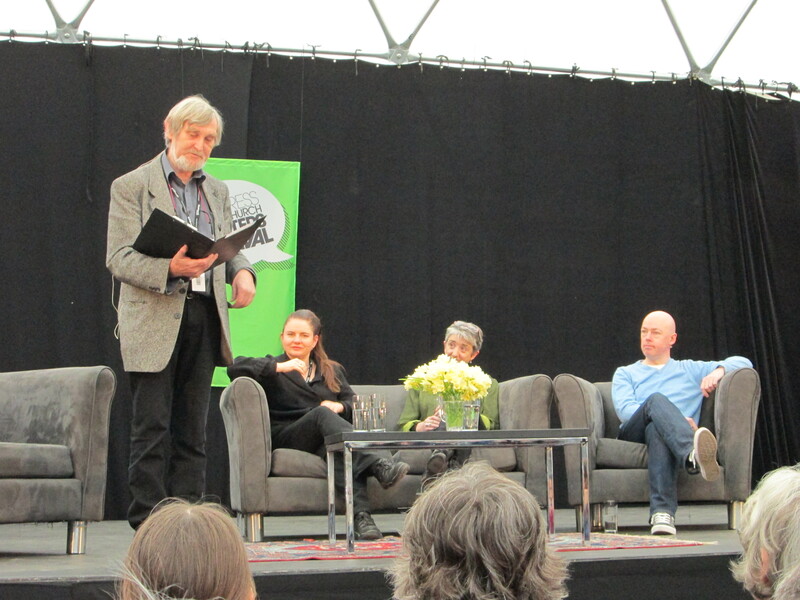 All the authors on stage seemed to agree that the classification bothered them. Each wondered how you would define YA, whether their work strictly qualified, and whether the idea of confining young people to a certain part of the bookstore was a good idea at all. Helen Lowe – author of the Wall of Night series – pointed out that a story having young protagonists (think Game of Thrones for example) didn’t immediately make it targeted at young readers. 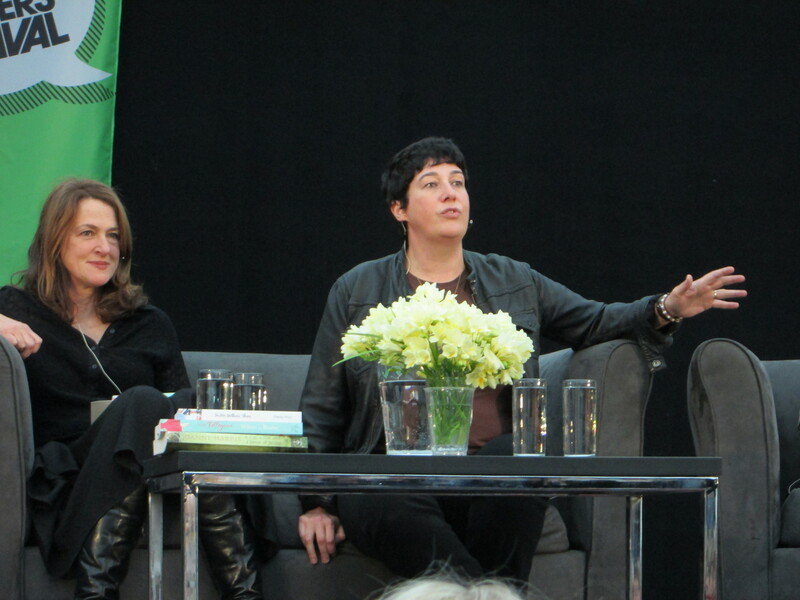 The panel on Sunday afternoon called “The Stuff of Life” was a chance to hear from Joanne Harris (Chocolat), Nicky Pellegrino (When In Rome) and Felicity Price (Head over Heels and A Sandwich Short of a Picnic). It was an absolute delight to each from each of these authors. Joanne Harris enchanted us with tales from her childhood and helped us understand what it was like for her, in between a French and English family, and the importance food played in her life – its intrinsic link, for her, to story telling. For Joanne Harris, the “Volatile chemistry” of small communities fascinated her, and she felt their nature transcended cultural borders. Her experiences from England were transplanted to the French countryside where they blossomed. I enjoyed the impromptu Margret Mahy readings that popped up here and there throughout the weekend. “Bubble Trouble” was particularly fantastic and the reader did an excellent job getting his mouth around the difficult phrases which sounded harder than Doctor Seuss! All in all it was an excellent weekend and it would be well worth the Christchurch Writers’ Guild looking at ways to be more involved next year. 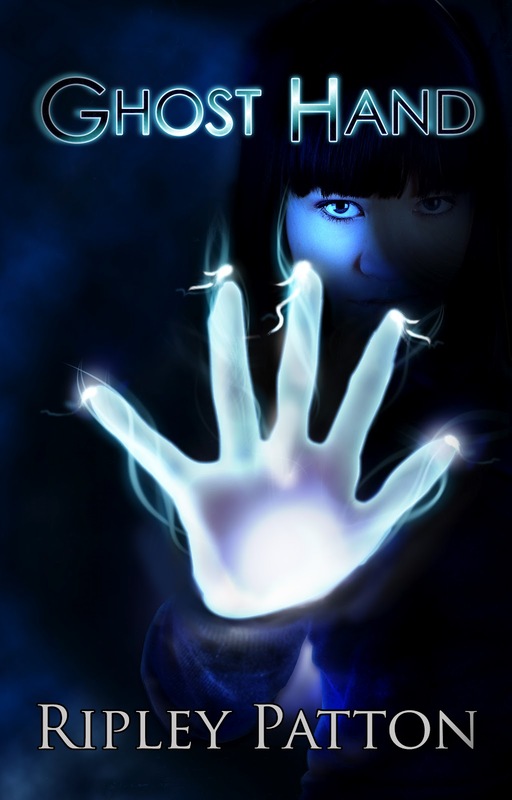 Cover for Ghost Hand designed by Kura Carpenter is an example of some of her latest work. Have you got a completed short story, novella or novel that would go great with a professionally designed cover? SpecFic NZ have just opened their cover contest to non-members. All you have to do is send them the first 1000 words of your completed story by 31st of August and the winner gets a professionally designed image by Kura Carpenter Design. For more details, check out SpecFic’s website. On Friday 10th Christchurch was treated to a visit by Derek Landy, author of the award winning children’s series “Skulduggery Pleasant”. It was hosted by the wonderful Children’s Bookshop. I was only introduced to Skulduggery Pleasant a week before, when raiding Beaulah’s bookshelf. I certainly wasn’t expecting a hilarious and wonderfully written romp in Ireland where I was shown an underworld of magic and plots that could destroy the world as we know it. Skulduggery the detective, and his unasked-for partner Stephanie, find themselves burdened with the task of saving the world. It turns out the engaging dialogue found in the novel reflects the author’s wonderful dialogue. He kept his young fans, and their parents, well entertained with tales that perhaps aught to be believed as much as his novels, telling them, “I remember being eleven, with the wife and kids. We grow up young in Ireland.” And saying to Beaulah and me that writing was easy, though it was clear he did not mean it. He added that people think he’s a people person during signings, but accepted the alternative I offered, that he gets high off the stench of permanent ink as he draws Skulduggery in every book. I loved the way he took time with every fan: talking and joking and answering questions. He was clearly happier to take time to pose for photos than us snapping impromptu ones, something to keep in mind for next time I attend one of his signings. I was shocked to see when I left the store, that the queue still extended well down the footpath, and I hoped those at the back would get a chance to see him too. Angela Oliver told us he kindly stayed well beyond the 6 o’clock finishing time to ensure everyone got their books signed, and chatted even to the last fans despite dark setting in. 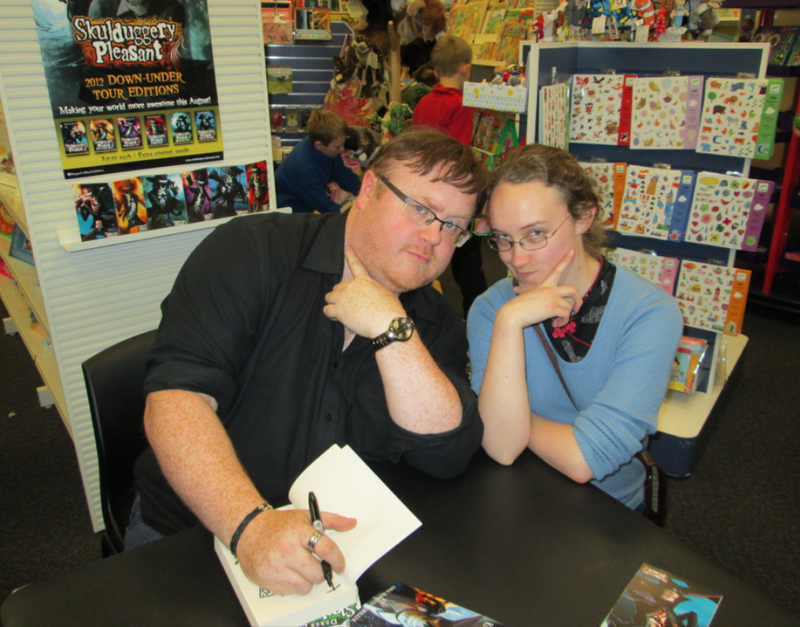 If you get a chance to go to a Derek Landy book signing I highly recommend it. The long wait due to his mass of fans was well outweighed by getting my book signed and getting to talk to him. And getting this picture of him and Beaulah. The Poets Respond to the Quake reading, held by University of Canterbury, celebrated National Poetry Day on Friday. Winners of the My Quake Nightmare competition were given the opportunity to read their poem. The poems enticed listeners to consider the quake from various aspects, giving us insight into how people were emotionally affected by the quakes, and the ongoing struggles of surviving in Christchurch. There was also an underlying theme of the way people pull together to get through crisis times, especially in the poem Block Party (the author’s name I regretfully forget). We were delighted to discover our CWG member, Helen Mongillo, was a winner of the competition. Despite the nervousness she showed before the event began, her reading was executed beautifully. The poem itself took us back to the day of the quake. It showed the way people became selfless, and did all they could to help others, despite danger to themselves. It also aptly captured the fear we all now live with: when will the next one be, and how much more can our buildings take? The event was MCed by Jeffery Paparoa Holman, who also read some thought provoking poems of his own, such as one regarding the death of a language; it was particularly relevant due to Maori Language Week last week and the continued declining numbers of Te Reo Maori speakers. 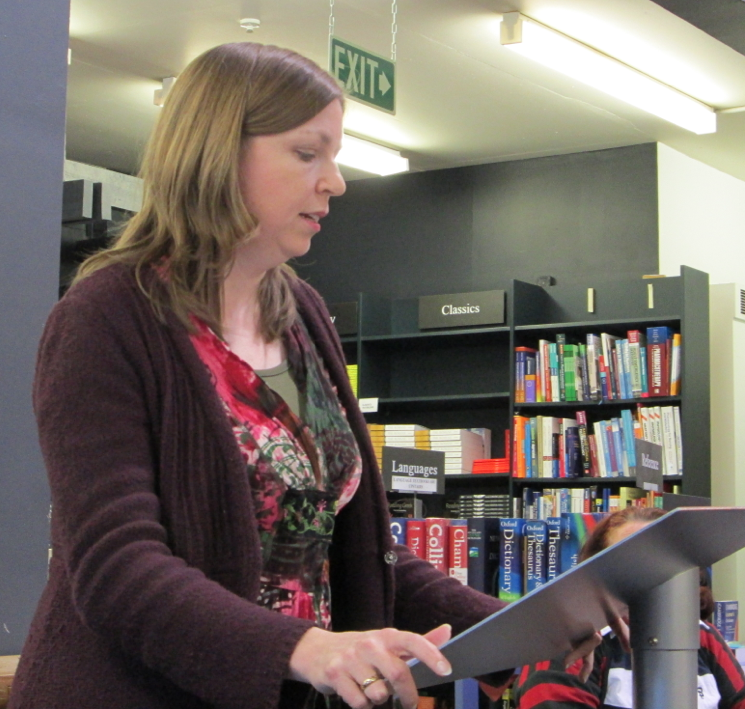 We were also treated to readings from Helen Lowe and Ben Brown, both of whom read wonderfully. Ben Brown reminded me of Glenn Colquhoun, as they both perform, rather than simply read their work. Definitely a pleasure to listen to. Helen Lowe’s poetry struck me as ethereal. I hope she one day publishes an anthology of her poetry so I can buy a copy, though she did tell me some poems are available on her blog site. Helen Mongillo has kindly given us permission to post her photo and winning poem here. I hope you enjoy her poem as much as we did. Helen Mongillo reads her poem at the Poets Respond to the Quake event. Normal day. Email, photocopy, edit. Floor rolls. Filing cabinet drawers move towards me. Must get out. Can’t walk. Falling files. Crawling. First aid course memories, “It’s alright! It’s going to be fine!” I call from hands and knees. Sobs from under nearby desk. Evacuation. Wait! My cell phone. Crawl under desk. Tug, tug at my hand bag, pinned under heavy metal cabinet. “Kirsty. Can you help?” She steps on books and files. Yanks metal. Bag free. Down four flights. Stairwell waterfalls. Must be bad. Kilmore Street crowded. Text kids. Where did these bruises on my arms come from? Back to work. Second floor, two story, pre-1970’s building, near city centre. What if there’s another one now? This tiny toilet. Cinderblock wall. Forgetting. Caught off guard again. Hold desk edge; do I go under? Laughter. Cursing. Eventually no comment at all. The strangest. Why do I stay here? It’s my life. This entry was posted in Events, Writing opportunties and tagged event, poetry. While looking for the Storylines post on the facebook page I noticed a few other up and coming events that I had forgotten, so since I just added categories that you can search by on the side bar I thought I would add the other events I found to this site too. Participants will be invited to submit a poem of between 10 and 20 lines on this theme. University Drive, Ilam, Christchurch 8041 before 20th July. No email entries. Next 5 winners receive a copy of Shaken Down 6.3. Please add you contact details to entry. All 10 winners will be invited to read their poem at the Canterbury University Bookshop National Poetry Day Event 27th July 12.30pm – 1.30pm. Poets Respond to the Quake. The first 30 people to attend the event will be given a free voucher for coffee or tea at the newly opened adjacent AdLib Café. This competition is to acknowledge excellence in creative writing in the Short Story genre. The contest is open to any emerging writer residing in New Zealand or Australia, who has had fewer than four stories/articles published in any format (print or digital).